Pleasanton, CA — July 11, 2018 — NextHome is proud to announce our newest addition to the franchise, NextHome Bloom Real Estate. The brokerage represents the 10th location opened in the state of Michigan for the NextHome franchise. The office will be owned and operated by top-producing broker Dave Bengston. NextHome Bloom Real Estate will provide real estate services to buyers and sellers such as single-family residential sales, first-time home buyers, investment, and land deals for areas of Grandville, Wyoming, Rockford, Ottawa, Sparta, Sand Lake, Kentwood, and the remainder of the Grand Rapids metropolitan area. As a suburb of Grand Rapids, Grandville is home to approximately 30,000 residents. Grand Rapids is the second largest city in Michigan, trailing only Detroit. With more than a million residents in the Grand Rapids metro area, NextHome Bloom Real Estate is primed to serve this booming community. Before real estate, Dave was in management for UPS. In 1995, he began part time in mortgages while still working at UPS full time. Five years later, Dave attained his real estate license, left UPS and never looked back. He started his own real estate brokerage in 2000 called Realty Consultants with two business partners. His business partners at the time ran the appraisal side of the brokerage, while Dave handled the real estate sales side. The partners grew the company to where the appraisal side became less of the focus and more concentration was on working on the investment side of the business. Realty Consultants began purchasing properties for rentals, as well as buying some properties to fix and flip for profit. In 2003-2004, the brokerage bought and sold more than 200 properties just with their portfolio, with another 50 transactions closed on behalf of other investors. When the economy changed in 2008, the partners dissolved the corporation. After his term with the partners expired, Dave continued the brokerage on his own under the name Real Estate 360. The 20-agent brokerage did very well, but Dave realized he was the one providing the bulk of business that was being done. Seeing the need to downsize, Dave worked to streamline the company to a team concept to have members supporting his high-producing business. In 2017, Dave saw the need to add technology to compete with some of the more tech savvy real estate companies that were coming into his community. He found NextHome via a simple Google search, but that research was backed by him speaking with existing NextHome franchisee, George Keely (owner of NextHome Keely Realty). “I really liked the technology the franchise offered, but I especially liked the ability to create my own culture in my company and support the business model I wanted for our brokerage,” he added. When not selling real estate, Dave loves spending time with his family. He and his wife of 31 years, Joanne, have five children. Please join us in congratulating Dave and the rest of the team at NextHome Bloom Real Estate on the opening of their new NextHome office in Grandville, MI! Pleasanton, CA — April 3, 2018 — NextHome is proud to announce our newest addition to the franchise, NextHome Victors. The brokerage represents the eighth location opened in the state of Michigan for the NextHome franchise. Based in Ann Arbor, the company will be owned and operated by business partners Kelly Boyd and DJ Kaufman. The brokerage will provide real estate services such as single-family residential sales, first-time home buyers, investment, luxury, multi-family properties, and REO/foreclosure services to the communities of Ann Arbor, Saline, Dexter, Chelsea, Ypsilanti, South Lyon, and the remainder of Washtenaw, Livingston, Wayne, and Jackson counties. Ann Arbor is home to nearly 115,000 residents, making it the sixth-most populated city in the state of Michigan. The city is home to the University of Michigan, which employs approximately 30,000 people. Originally from Michigan, DJ moved to Fort Lauderdale, Florida in 2006 to explore project management opportunities. His family had always invested in real estate and he wanted to take his experience and see what positions were available in the Florida housing market. It was there that he met his future fiancé, Christina, in 2010. The couple moved to Christina’s hometown of Gainesville, Florida where they relocated for her career at the University of Florida hospital. Now living in Gainesville, DJ moved away from project development and started his career on the sales side as a REALTOR® in 2012 with Watson Realty. As a brand-new agent, he sold 11 homes in his first year and grew his business to close over 70 transactions in 2013. When Christina had an opportunity to work in the pediatric cardiology at the University of Michigan, the couple moved back in 2017 and DJ continued his high level of real estate home sales. Born in Detroit and a long-time resident of Ann Arbor, Kelly started his real estate career in 2015 after 20+ years in the animal health industry. As one of the top salespeople for the Fort Dodge Animal Health company, he decided to get into real estate and use his exceptional sales skills to help buyers find their dream home. Loving the idea of being a resource to the community, Kelly always appreciated the small business approach of staying local and providing high-knowledge, high-touch real estate service. Working for Keller Williams in Ann Arbor, Kelly build a solid real estate sales business in a very short amount of time. DJ crossed paths with Kelly in 2017 when he moved back to Michigan and began looking for a brokerage to align with. “From the moment that I met DJ, I found him to be smart, articulate and a well-presented professional,” recalled Kelly. When the two began discussing the opportunity of working together and starting their own brokerage, DJ remembered a real estate company that he thought would be a perfect franchise model to affiliate with. “It really is the way real ought to be,” he added. When not selling real estate, both men love spending time with their families. DJ and Christina have a seven-year-old son, Treyton, who is involved in all sports – including their favorite, soccer. Kelly and his wife of 26 years, Lea, have two daughters – Stephanie (age 22) who is a pre-school teacher, and Bridget (20) who is a student at Hillsdale College. The Boyds love to travel and will be visiting the beautiful state of Wyoming in summer of 2018. Please join us in congratulating Kelly, DJ and the rest of the team at NextHome Victors on the opening of their brand new NextHome office in Ann Arbor, MI! Pleasanton, CA — March 2, 2018 — NextHome is proud to announce our newest addition to the franchise, NextHome City Realty. The brokerage represents the seventh location opened in the state of Michigan for the NextHome franchise. Based in Birmingham, the company will be owned and operated by top-producing REALTOR® Paul Mychalowych. The 14-year real estate veteran will also serve as the broker-of-record for the company. In 2009, after years as a top-producing REALTOR®, Mychalowych decided to open his own brokerage – Birmingham Realty LLC in downtown Birmingham. As the broker of a successful office, Mychalowych did not rest on his laurels. Please join us in congratulating Paul, Lisa, and the rest of the team at NextHome City Realty on the opening of their brand new NextHome office in Birmingham, MI! Pleasanton, CA — February 13, 2018— NextHome is proud to announce our newest addition to the franchise, NextHome Sampson Realty. The brokerage represents the sixth location opened in the state of Michigan for the NextHome franchise. Based in Livonia, the company will be owned and operated by real estate broker Miles Sampson. NextHome Sampson Realty will provide real estate services such as single family residential sales, first-time home buyers, multi-family properties, investment sales and commercial to the areas of Livonia, Plymouth, Northville, Novi, Ypsilanti, Monroe, and the remainder of Wayne County. With a population of nearly 100,000, the city of Livonia is located 15 miles Northwest of Downtown Detroit. Sampson has been in the real estate industry since 2007. Starting as an assistant to a high-producing REALTOR®, he handled all details of the transaction from contract to close. With a specialization in streamlining the escrow process, Sampson was a valuable member of the real estate team. In 2009, Sampson took a role as an Assistant Market Center Coordinator for a local Keller Williams Realty. With responsibilities such as accounting and management of the entire brokerage’s transactions, Sampson quickly learned how to handle dozens of transactions at any given time. While fulfilling, Sampson wanted to take his talents to the sales side. In 2011, Sampson made the move to full-time REALTOR® and over the next six years, he steadily built a very successful real estate business. In late 2017, Sampson felt that after nearly a decade in the real estate industry, it was time for him to open his own brokerage. Understanding the value of leverage, he looked to partner with a franchise that aligned with his values and brokerage needs. When not selling real estate, Sampson volunteers for Bethany Christian Services, where he works with foster/adopting parents. As an instructor for the foster care skills class, Sampson helps families adapt to provide a home for these children. Sampson loves spending time with his wife of seven years (and college sweetheart), Sarah. They have a two-year-old son, Elliott. The couple enjoy playing a unique card game with their friends called “Euchre” (pronounced Uke-Er). Please join us in congratulating Miles and the rest of the team at NextHome Sampson Realty on the opening of their brand new NextHome office in Livonia, MI! Pleasanton, CA— March 31, 2015 —NextHome is proud to announce our newest addition to the franchise, NextHome Edge – our first franchisee in the state of Michigan. Owned and operated by a trio of business partners Jeff Scott, Kathy Roza, and Brad Sandberg, the brokerage is dedicated to serving the needs of clients in Detroit, Downtown Plymouth, Northville, Dearborn, Dearborn Heights, Redford and the rest of Southeast Michigan. 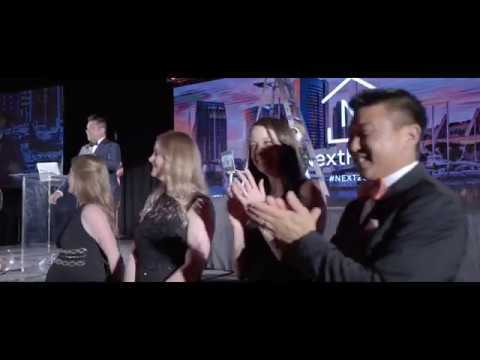 NextHome Edge is a continued business venture created by the three partners in addition to their already extremely successful real estate property management company, Michigan Management. The Plymouth–based property management company is in charge of managing over 700 units monthly and built this business in just four short years. With Sandberg as the leasing agent, Scott handling the marketing, and Roza as the manager, the three business owners met while working on the same management project. “We knew that all three of us had the same drive and found our style of work flow to be alike. It was natural for us to partner up and see what we could create together,” said Roza. Originally wanting to focus strictly on property management, the partners were content to refer out business to real estate agents when it came time for their property owners to sell their property or acquire a new one. But as the years continued, the service level from the agents in the local area became more and more frustrating to the partners. Calls were not returned. Promises went unfulfilled. “We knew that we could deliver a great client experience better than any existing agent in our market. We knew it was time to open our own real estate sales brokerage,” said Roza. As a talented group of Gen X’ers, the partners knew they wanted to work with a franchise they could believe in and resonate with their team. After looking at many options, they became disenchanted with the idea.